Where’s the stock market going? Turns out, an RMD strategy is pretty good for retirees. Sparing readers the gruesome details of Webb’s mathematical calculations, this relatively simple strategy did well when compared against a more complex standard that would allow retirees to spend the maximum amount possible, while minimizing the possibility they’ll run out of money. And the simpler RMD strategy can work for Lewis’ well-off clients or for someone who’s saved $120,000, which was the median amount of retirement savings for older working households in 2010. Under the RMD strategy, the percentage of their financial assets that retirees can withdraw each year increases as they age, from 3.13 percent at 65, to 4.37 percent at 75, and 6.76 percent at 85. These percentages apply to how much principal can be spent. According to Webb’s calculations, retirees can spend more than that: they can also spend the interest and dividends generated by their invested savings. Of course, there are no iron-clad guarantees the money will last. One Japanese man lived to be 116 years old. But the RMD strategy is also better in one critical way from the “4 Percent Rule” popular among financial planners, which allows retirees to withdraw 4 percent of their initial balance on Day 1 of retirement. 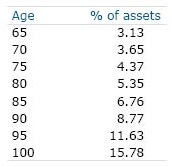 The RMD’s percentages are applied annually to the investment portfolio’s current market value. Many retirees still may not be convinced. But at least think about it. To see the complete RMD schedule for every age, or to learn more about Webb’s proposed strategy, click here. 5 Responses to Retiree Paralysis: Can I Spend My Money? I enjoyed the conversation a great deal and am glad to see you have published such an important message for people to consider. There is more to money than money®. At whatever level people have accumulated resources, they deserve to enjoy them as much as possible. My mom and my mother-in-law lived into their late 80’s. Both were reluctant to spend their money because they might need it for their “old age”. They could never equate their current circumstances with “old age” even in their 80’s. I like the RMD idea and applied it to myself for the last two years, even though I haven’t reached 70 1/2. My wife’s IRA is intended for those dreaded medical expenses that could appear. My wife and I, in our early 70’s, do have a retirement floor – Social Security, annuities, and interest, which more than meets our needs. We take some more money off the table a few months at a time, but it is sitting in a money market fund until at least September. I was retired on disability 20 years ago and have yet to withdraw from capital, except for buying cars. Thank you Lord. I too like the idea of using the RMD as a basis for what to take year-to-year. For one thing, you won’t get in trouble with the IRS doing it that way. And for another, if you end up taking more than you need by following this, then you may always save or invest it in other things. I strongly agree with Al. Using RMD is really the way to go . Thanks for the really great info for the older guys and people who care about them.